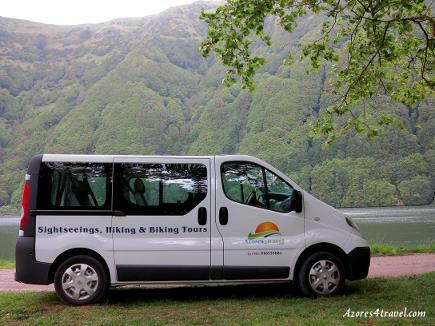 Get your holiday trip off to the best start with an airport transfer from Azores4Travel. We want you to have a smooth journey to your destination and an easy trip back to the airport. We pride ourselves on offering excellent customer service. Holidays, the best time of the year! After booking and planning everything you finally arrive to your destination. While you are waiting for your luggage, you realize: there is nobody waiting for me! How do I get to the Hotel from here? We will be at the arrival lounge waiting for you and will drive you directly to your hotel. The transfers for your return flight are the same price and you will be dropped at the airport with time enough to check-in for your flight. Book your personal Airport-Transfer with us. You just need to give us your flight details and according to your personal requirements, our comfortable van will be ready and waiting for you while you collect your luggage. GREAT VALUE Low, low prices without sacrificing great service. - Door-to-door itinerary - Ponta Delgada Airport transfer with no stops. Ponta Delgada, Gateway To The Azores Ponta Delgada International Airport, known as the Joao Paulo II Airport, in honor of Pope John Paul II, who visited the city during his papacy, is the primary airport serving the Azores Islands. The international airport code for the Joao Paulo II Airport is PDL, reflecting its location on Ponta Delgada, on of the principal cities of the Azores. Children safety - Children under 12 years old must travel on appropriate safety seats. You can request baby seats and booster seats in the children safety step during the booking process. Passengers with disability - To fit properly in our vehicles we can only transport personal wheelchairs with folding / collapsible frames. Passengers with disabilities or reduced mobility must be capable of boarding the vehicle independently or with the assistance of those in their party or the driver. Payment options - Our vehicles are not equipped with devices capable of processing credit cards, drivers are only able to accept cash - euros only. If you wish to pay with credit card, please, do it online in advance during the booking process. Insurance and Guarantees - We meet all the mandatory insurance legislation. We are a fully licensed private transportation company, authorized by the portuguese board of tourism with the licence RNAVT 5903. Airport Transfers - After you leave the luggage collecting area at the airport, the driver will be waiting at the arrivals hall holding a sign with the lead passenger name. Transfers from Your Accommodation - The driver will be at your hotel / resort reception or private villa door at the specified pickup time. Flights delays - No need to worry. We always check your flight status directly with the airport control and wait until your arrival - no extra charge.